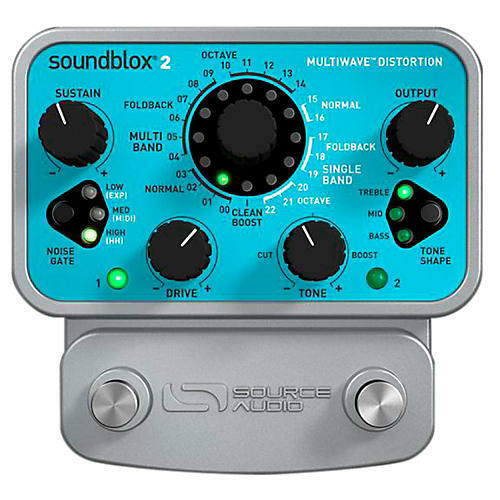 The Soundblox Multi Wave Distortion is an anti-retro unit that offers 23 matchless effect types, ranging from traditional to extremely distinct and aggressive synth-like distortions. The Multiwave's effect types are divided in two categories: Multi Band and Single Band processing. Each processing category is then broken down into three more subcategories: Normal, Foldback, and Octave. Multi Band processing splits the input signal into 10 distinct frequencies, distorts each one separately then recombines them for the final output signal. The process produces a hugely diverse set of tone possibilities, depending on the chosen sub-category. Multi-band Normal offers a crisp distortion with sturdy attack, and heightened note articulation. Multi-band Foldback produces wild synth-like distortions nasty enough to please the most extreme fuzz pedal fanatic. Multi Band Octave creates octave-up distortion tones unlike any harmonizing box on the market today. The Multiwave also offers Single Band processing which employs a more conventional approach by applying distortion to the entire signal. The result is a slightly more traditional, but equally diverse and expressive set of guitar tones. Plus, the Multiwave is Hot Hand ready for even more possibilities. Order today and take firm control over your distorted signals. Diverse sound palette ” featuring 21 varieties of our distortion algorithm. Multiband processing ” signal is split into multiple bands and distorted individually for unprecedented sound clarity. Modern Design ” a thoughtfully designed box that features rugged construction and sleek looks. State-of-the-art DSP ” our proprietary 56-bit Digital Signal Processor, the SA601 and crystal-clear 24-bit converters. Motion Control ” all Soundblox pedals are ˜Hot Hand Ready' and can be used with any Hot Hand motion sensor to extend the capabilities of the unit. Active Analog Bypass ” bypass is fully routed around the DSP and active input ensures zero signal degradation. Dimensions: 7 in./17.8cm (length not including I/O jacks) x 4 in./10.2cm (width) x 2 in./5cm (height, including knobs).